The World of Music is a music listening book designed for the growing number of teachers who want to focus on listening to music as it exists in the real world of their students. Expanding the traditional repertoire used for music study, this popular text begins with American folk, religious, jazz, popular, and ethnic music before introducing some world music and concluding with a thorough overview of Western classical music. The approach captures the essence of each repertoire, and equips students to recognize different styles, appreciate their different functions, and possess a solid foundation for a lifetime of musical appreciation. The text also introduces students to the many styles of music currently enjoyed by people in the United States and helps them to appreciate the diverse roots of these styles. 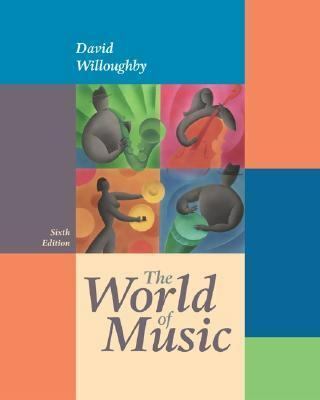 In addition, the text encourages its readers to appreciate different cultures around the world through an encounter with their music.Willoughby, David is the author of 'World of Music ', published 2006 under ISBN 9780073127002 and ISBN 0073127000. Loading marketplace prices 15 copies from $5.98 How does the rental process work?